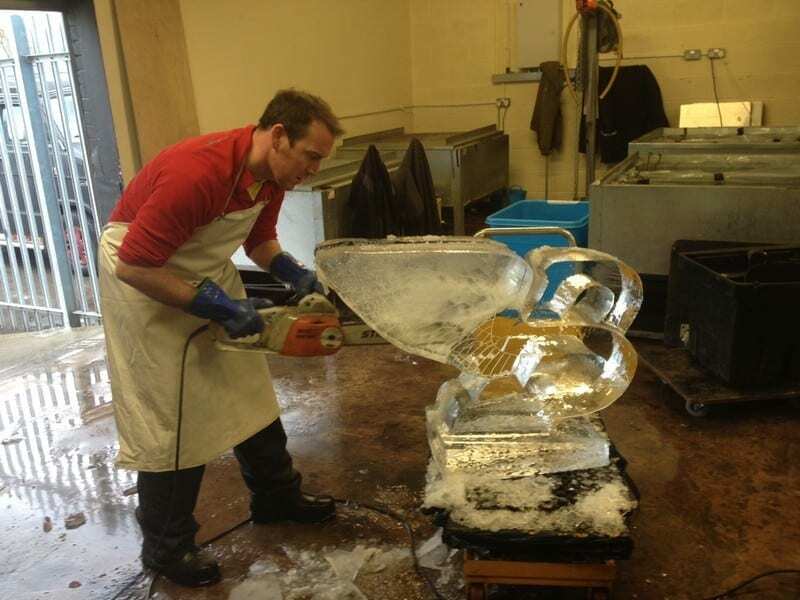 Our work frequently takes us outside of Merseyside, across the country and beyond, although some of our most exciting ice sculptures have been created in London. 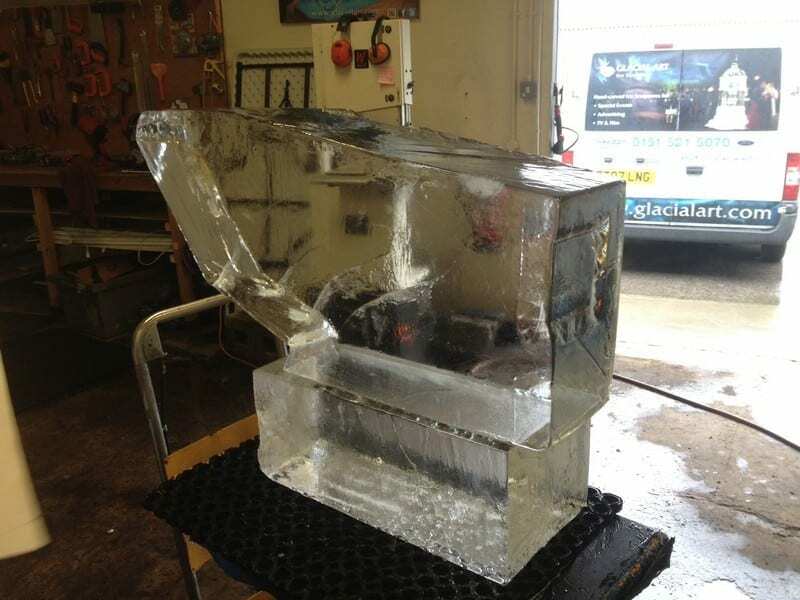 In the eight years we have been in business we’ve carved ice sculptures, bars, luges and so much more for some of the biggest design and launch events in the UK, and as always we exceed expectations to please the company and amaze crowds and spectators who love to watch us work on live jobs. 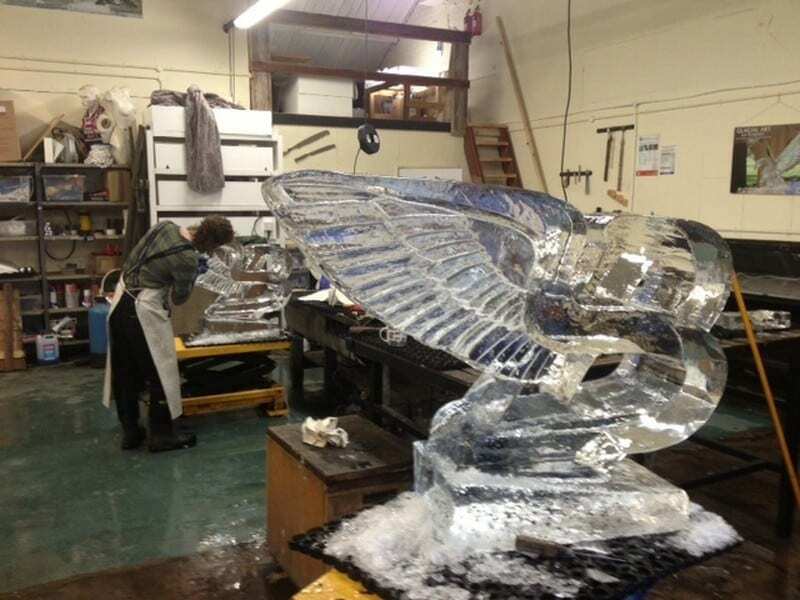 Whether we’re working from simple designs or putting together a room of decorations from abstract designs, we’re equipped and eager to take on challenges to create unique ice sculptures in London. In 2011, we were given the opportunity to work with one of the finest vodka brands in the world, Finlandia, on the launch of their new ‘melting bottle’. The bottle design, which went on to win awards for packaging design, was inspired by the glacial ice that has fed the Finnish water they now use to create their vodka, and aimed to capture that moment when ice begins to become water.They stayed true to their heritage and had the bottle and packaging designed by some of Finland’s top artists and designers. 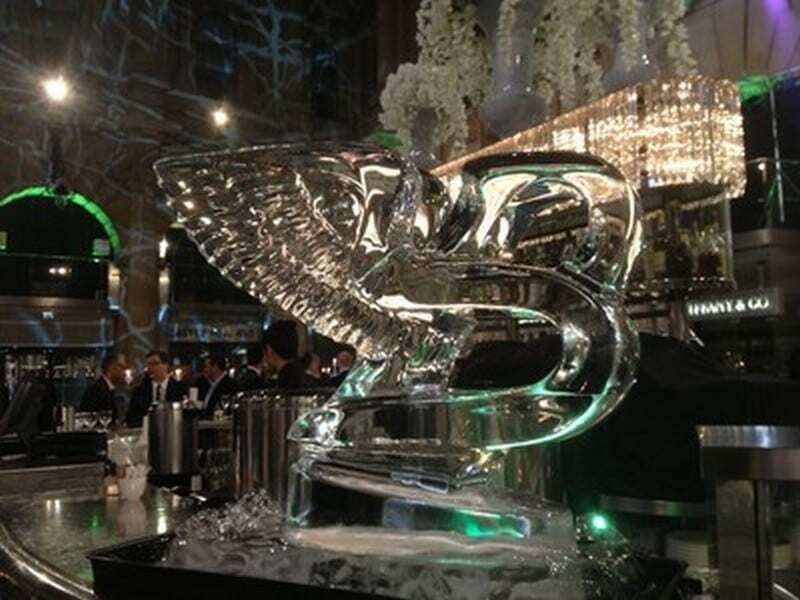 Our part in the exclusive launch was threefold; to showcase the new bottle design, to design a cocktail ice bar for the serving of drinks, and also to provide entertainment in the form of live ice sculpting. Our preparation involved four days of freezing to capture the solid bottle and Finlandia logo in a block of clear ice, and building a metre long ice bar complete with back pod and speed rails for an excellent serving experience. We also invited guests to help as we carved the famous Finlandia Reindeer into a huge block of ice, taking three hours in total. 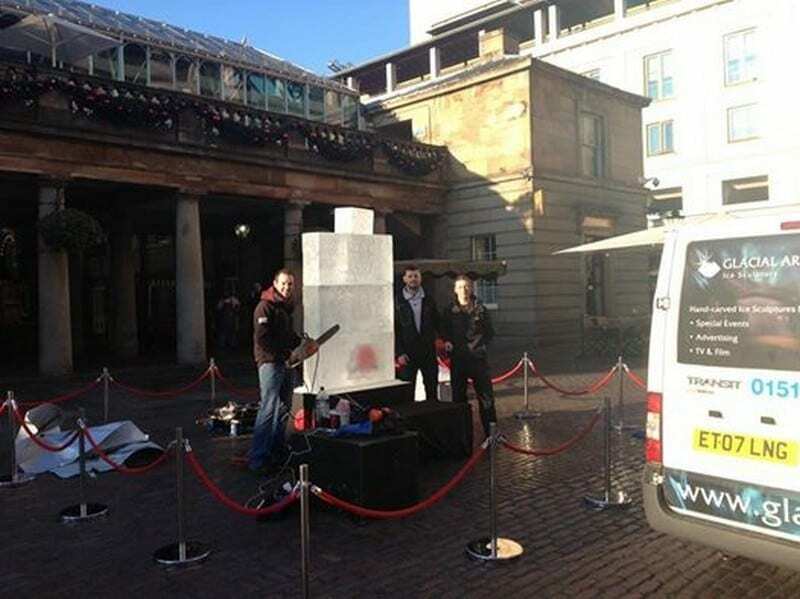 As live ice sculpting is a particular speciality of ours, we welcome and embrace any opportunity to showcase our skills in public. In December of 2013 we were asked to do just that in the heart of Covent Garden as a promotion for a new restaurant, The Big Easy. 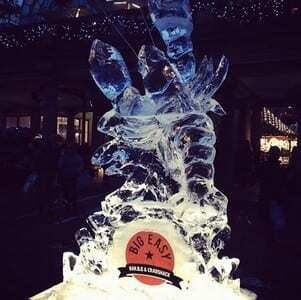 As waiters served oysters and claws around us we entertained the crowds with a five hour live ice display during which we created an eight foot tall Lobster from just four blocks of ice. It took us an hour to set up the carving station but all the time spent was worth it for us and for The Big Easy when we both could stand back and appreciate our monstrous Lobster – and the crowds absolutely loved seeing us at work. When working with the Scandinavian Business Seating company in January of this year, we were mostly concerned with capturing the elegant design of their award-winning seating. Using our model making skills and knowledge we came up with a number of solutions. Unsurprisingly, the company opted away from building bespoke containers in which to freeze the entire chairs, and instead, through our advice we created a mix of ice-captured chair parts and carved ice replicas. 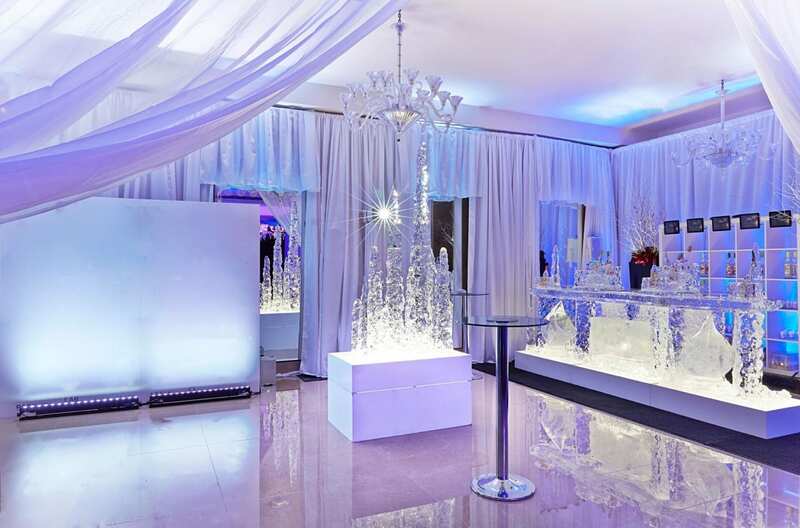 We provided full ice specifications and designs to the client as in any piece of ice art that has any technical element. The RBM Noor Chair was the simplest to build from a single block of ice, while the RH Mereo Swivel Chair was carved out of four separate blocks of ice placed together, both taking around five days in total. 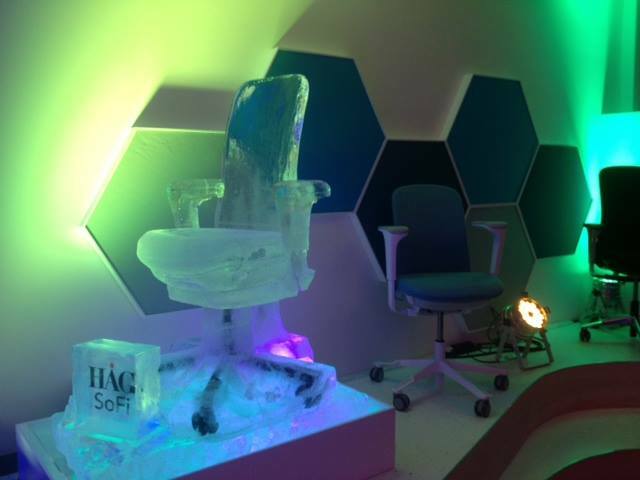 Finally the HAG SoFi Chair was carved primarily from blocks, but we froze the wheels in transparent ice in order to give a firm and impressive grounding to the finished product. We knew they’d be scrutinised as they were sat right next to their real counterparts, so it was important to get them exactly right! Backlighting made them look incredible and around 350 visitors from the design community were able to enjoy the sculptures as they perused the newest chairs from this well-respected company. 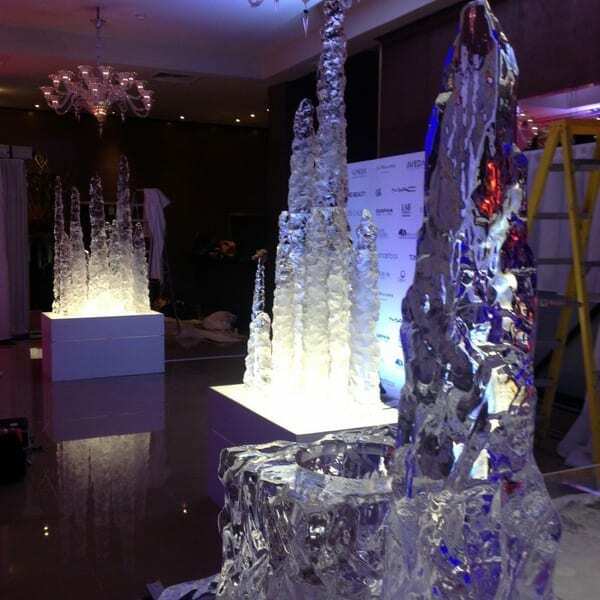 We have very precise specifications to work with when taking on a job as ice sculptors in London. 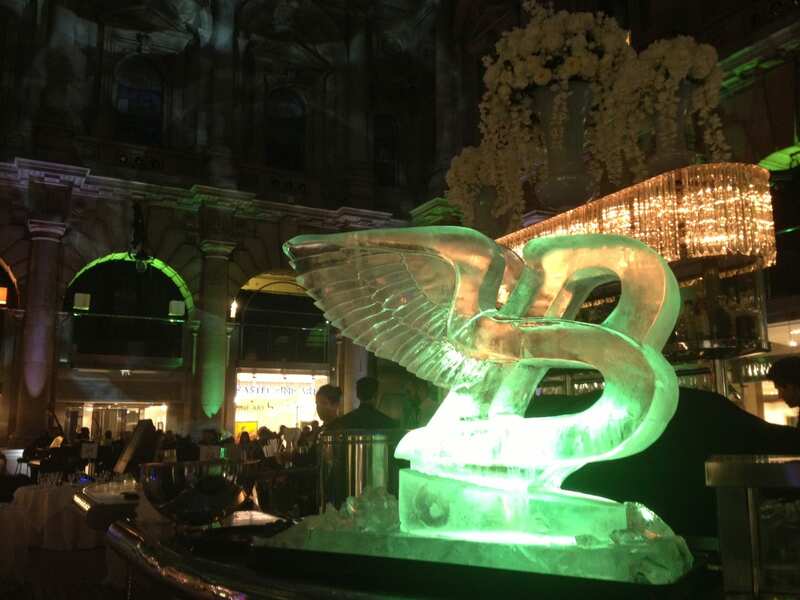 While we love to be creative with our work, we were also thrilled when the prestigious car company Bentley got in touch with us and asked us to create sculptures based on their ‘Flying B’ logo for their Gala Dinner and the last night of the 2014 Worldwide Dealer Conference. The event was held at the Royal Exchange and we provided two sculptures, each a metre long and eighty centimetres tall, to flank the bar on each side. They were illuminated from behind by green LED lighting, and we think they came out fabulously! On the more creative side of things, Branch Out Productions in London contacted us last year about assisting them to design a beautiful bar for their promotional event. Armed with a loose specification and some mood board imagery, we worked closely with the company to create the ambience they wanted for the event – minimal, sophisticated and clean. We created a series of three sculptures of icicles stood upright, a hundred ice shot glasses for guests to use, and most importantly a three metre long ice bar with logo for the Crystal Room. The result was stunning, even if we say so ourselves. One of the best parts of working as an ice sculptor is all the incredible places the job takes you. We’ve worked with hit television shows, nervous couples in the run up to their weddings and some of the biggest companies in the world, and we’ve been lucky enough to be able to travel across the UK and beyond for it. If you give us a challenge, we’ll rise to it, no matter where you are.